A party event and rental business’ marketing collateral can speak volumes about the professionalism of the company. It can also put you miles ahead of the competition. Marketing collateral refers to all of the written marketing and sales pieces your customer will come into contact with as you try to win their business. 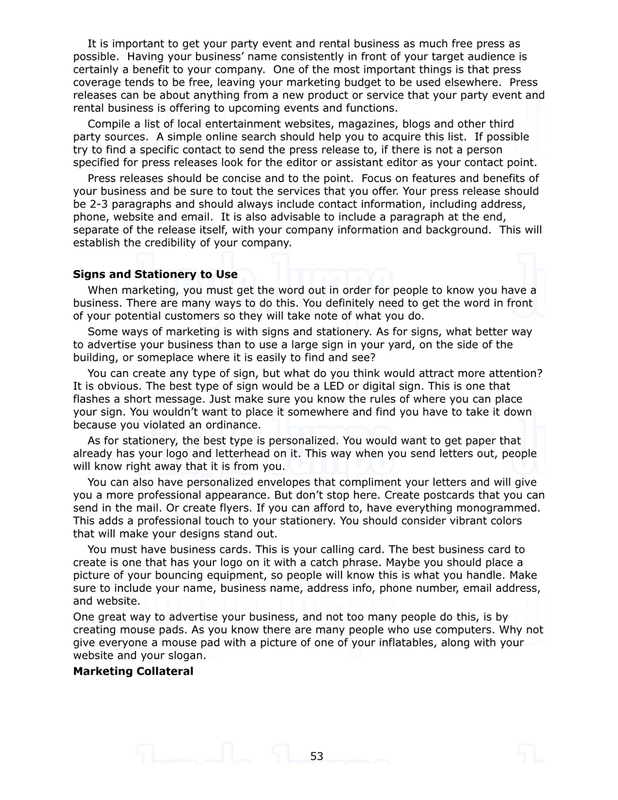 You need to determine and have a plan as to how you will win a customer and present them with your products and services.The following are some pieces you should consider when putting together you marketing collateral:Brochures – These can cover all-in-one; information about your company, inflatable photos, testimonials, product information.Catalog of Products and Services Available – Consider what you will give your customers to look at to determine what products they are interested in. This may be done all online, but a catalog is also a nice point for selling.Product Fact Sheets – Each fact sheet should focus on one product or product line. The information should include product name and photos, distinctive features, comparison to other similar products and cost.Company Sheet – To stand out from other businesses in the entertainment industry give your customers a fact sheet about your company. Include the date the company was founded, location, name and background of founder(s), contact information and a brief mission statement.Clip File – Whenever anything is written about your company by a third party (only favorable information of course) collect and maintain this, preferably in a binder. You can show customers the breadth of your company with this type of information. You may also want to include advertisements and printed marketing materials in this file.The design and printing process of marketing collateral can be costly for a small business. While items do need to look professional there are ways to cut corners. The major pieces for your company, like the brochure and catalog, should be professionally printed on a nice paper stock in four color processing. This will be the bulk of the cost for your marketing collateral. Supporting items like the fact sheets and company sheet can certainly be printed in house. When printing these items in house make sure you use a thicker paper stock than the standard 20# paper. A glossier paper is also a small price to pay for a more professional appearance. If you do not have a nice color printer black and white can suffice for these items.Many companies in the party event and rental industry do not bother with designing and printing this type of marketing collateral. Doing so will give your business a more professional appearance and help you to win sales.Designing Effective Marketing FlyersHand-outs or flyers are a great and economical way to market your inflatable business. You can travel door-to-door with the flyers, attach them to cars or simply drop them off at high traffic locations in your geographic location, such as the library and local toy stores. Just one new customer and this marketing medium has more than paid for itself.